Long gone are the days when holiday dinners came solely from the pages of the Better Homes and Gardens Cookbook that every family had on a shelf in the kitchen. More and more, diners are eating out around the holidays (or even on the holidays). With the internet came food blogs and Pinterest, Netflix Original cooking shows like Chef’s Table, and a vast collection of recipes that are now just a Google away — for free. Chefs today more access to potential inspiration for experimenting with new ingredients and recipes, and what better time than the holidays to put a popular new dish on your menu? Offering popular holiday dishes as specials at this time of year is the perfect way to entice new guests to visit your restaurant. It’s also a great time to be found online if you update your website’s menu section in a timely fashion. Using Google trends data from the United States between Nov. 1 and Dec. 31 in 2017, we discovered the most-searched-for recipes of the holiday season, taking the guesswork out of which popular recipes you should offer in your restaurant. To our surprise, we saw that some old-school favorites didn’t make it on the list like traditional eggnog, fruitcake, and Christmas ham. Why? They’re done every year. They aren’t trending with guests the way these trending dishes below are. Adding these dishes to your menu this holiday season is sure to give your guests a taste of the holiday cheer they’re likely searching for. Of the most-searched-for holiday recipes, only one was for a holiday beverage. But if you want to offer your guests a delicious holiday drink special that they may not have tried before, this one is sure to be a hit. “Coquito” is Spanish for “little coconut.” This Puerto Rican drink, which is kind of like a coconut eggnog, is a Christmas must-have in many Latin countries. There are alcoholic and non-alcoholic versions, so a coquito recipe may just be all you need to offer a bestselling holiday drink special that appeals to most of your guests. Many restaurants, like the Daily Dish in Silver Spring, MD, have been hosting coquito-inspired benefits to support victims of Hurricane Maria in Puerto Rico—a great way to attract guests inspired by both this delicious drink and a worthy cause. Tis the season of love, joy and giving, right? Your guests will want to start their holiday meal off right. With these apps, they’ll definitely feel the holiday spirit. 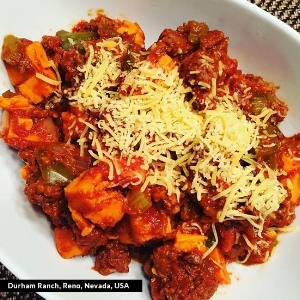 Searches for a slow cooker elk chili recipe spiked 3,550 percent last holiday season, and no wonder — a bowl of hearty chili is the perfect way to warm up on a winter day. It may take some effort to track down elk meat, but it’s in season during fall and winter, so it’ll make a great addition to your holiday specials menu. Searches for copycat recipes of “Crazy bread,” buttery, garlicky bread sticks served by a number of pizza chains, spiked 2,200 percent last holiday season. It’s unconventional, but give the people what they want by adding parmesan dusted, Italian style breadsticks to your holiday specials appetizer menu. Searches for monkey bread recipes, especially ones that employ a slow cooker, increased by 2,150 percent during the holidays last year. This sticky, gooey pull-apart bread could easily be classified as a dessert, but since the holidays are all about indulgence, make it an appetizer and let your guests start their holiday meal off with a delicious favorite. These fried potato pancakes are a staple on Hanukkah tables. But a good latke recipe has a place in any holiday dinner, as evidenced by the 900 percent spike in searches during the holidays. Adding them as a holiday appetizer makes use of ingredients you probably already have on hand, and gives guests an option for a savory start to their holiday meal. The main course isn’t the only star of the holiday table — everyone knows a Christmas or Hanukkah dinner isn’t complete without the sides. These were the most searched side dish recipes in November and December last year. Searches for au gratin potatoes recipes jumped up 1,900 percent during the holidays last year. They’re a classic, so adding this cheesy potato dish to your holiday menu is sure to please guests. An easy way to up your stuffing game is with a great cornbread dressing recipe. This Southern staple is becoming a nationwide holiday favorite, according to the 750 percent increase in searches last year. There’s a fierce battle raging over whether holiday sweet potatoes should be topped with honey and pecans or marshmallows, but that didn’t stop searches for sweet potato casserole recipes from increasing by 1,200 percent during the holidays. It’s another recipe that uses a lot of pantry staples, so it’ll make an easy addition to your holiday specials. You could also give guests a choice of which topping they’d like. There’s cornbread, and then there’s the gooey, cheesy casserole version, which saw a 700 percent increase in searches during the holidays. Adding a corn casserole recipe to your holiday repertoire means you’ll have a satisfying side that’s a little more festive than plain cornbread. Here it is: the star of the holiday table. There are so many more options than turkey and ham, as evidenced by Google searches for holiday main dish recipes. If you’re serving turkey on your holiday menu, take it to the next level with a good brine. Searches for brined turkey recipes saw a 3,000 percent increase during the holidays, and brining is a great way to ensure you end up with juicy cuts that are full of flavor. If your holiday menu needs a comfort food, it’s time to find a chicken a la king recipe. Chicken, sherry and veggies in a cream sauce — it’s basically chicken pot pie without the crust. It’s easy to make, uses ingredients you probably already have on hand, and searches for it increased by 200 percent last holiday season. A surefire way to attract holiday diners is by offering a prime rib special. A good prime rib recipe is the height of holiday decadence, and searches for them spiked by 750 percent during the holidays last year. Sweet treats dominated the most popular searches for holiday recipes in 2017. Use these recipes to amp up your holiday menu with dessert specials that will wow your guests. Searches for chocolate angel food cake recipes increased by 180 percent during the holidays, and it’s easy to see why. It’s a light, decadent dish that’s easy to make and to dress up with fruit, whipped cream and other toppings. It’s easy to dress up a simple angel food cake with another staple holiday ingredient: canned pineapple. Searches for angel food cake and pineapple recipes jumped 120 percent last holiday season, and this dessert is an easy addition to your holiday menu. Searches for devil’s food cake recipes went up 250 percent around the holidays, which means it’s probably a safe bet adding this decadent, rich chocolate treat to your menu as a holiday dessert special. This may be the most classic of holiday desserts, so it’s really no wonder that searches for yule log recipes increased by 2,800 percent around the holidays last year. Adding a yule log to your holiday dessert menu is a surefire way to get into the Christmas spirit. Bread pudding is delicious at any time of the year. But especially in the cold winter months, this rich, carby goodness really hits the spot, and as a holiday special, it’s sure to be a bestseller. Searches for bread pudding recipes (or, specifically, “best bread pudding recipe ever”) increased by an insane 4,550 percent during the holidays, making this the actual most popular holiday recipe on our list. Armed with this many recipes (and the data to back them all up), your holiday specials will be just what your guests need to feel and taste the spirit of the season. Happy holidays!